Awarded full accreditation by the Commission on Accreditation of Medical Transport Systems (CAMTS) for rotorwing (helicopter), fixed wing and ground transport. Started in 1996, we became a dedicated team in 2005. The Pediatric Transport Team consists of pediatric critical care nurses and respiratory therapists specially trained in advanced airway management and stabilization of acutely and critically ill and/or injured infant, pediatric and adolescent patients. We have 10 RNs and 9 RRTs on staff with an average 7 to 10 years of critical care experience. The team is a dedicated team (meaning their sole job is pediatric transport while at work, so they are available as soon as called) 7 days a week 24 hours a day. We are the only CAMTS accredited service for pediatric patients in the Central Texas area. Primarily we service the 46 county area surrounding Austin, but we are capable of traveling all over the US, Mexico, and Canada to bring children to Dell Children’s Medical Center of Central Texas or take them to other facilities for specialized care not provided in Austin. We have specialized partnerships with Acadian Ambulance Services to provide us with vehicles and drivers for ground transport, StarFlight to provide us with a helicopter and pilot for rotor-wing flight capability, and Air Medical INC to provide us with a private fixed-wing aircraft and pilot for long distance air transport. We can also be requested using the 324-0KID line for ED to ED transfers or via the physician transfer line for hospital to hospital transfers. A transfer utilizing the pediatric transport team can be requested by calling the toll free transport line, the ED transfer line, or the PCRS physician referral line. As soon as administrative approval is obtained, we deploy either by ground or air depending on the severity of the child, the distance to the sending facility, and the weather and/or traffic conditions between the sending facility and Dell Children’s. When we arrive at the sending facility we work with the doctors and medical staff to further stabilize the patient if needed. We can continue all previously order medication or infusions enroute back to Dell Children’s. Additionally, we are able to start any additional therapies needed as soon as we arrive at the bedside and operate as a “mobile PICU” if needed. 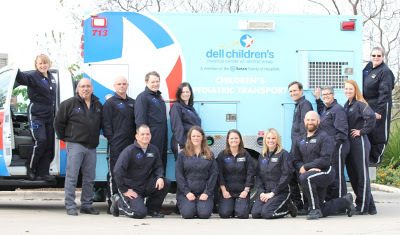 Regardless of the mode of transport we have the capability and prefer for one parent to ride with us in the ambulance or aircraft back to Dell Children’s. Copies of any radiological scans or X-rays done on the patient.